As we all know, a burn on your hands or forearm is not only painful, but can be a real inconvenience. In order to offer better product to our customer,we were always looking for oven mitts that provided serious protection from heat and burns. When we see them,we know it is what we want! Oven mitts from AICOK have the flexibility of cotton and the heat resistance of silicone. It is a 'Must-Have' Tool in every kitchen. 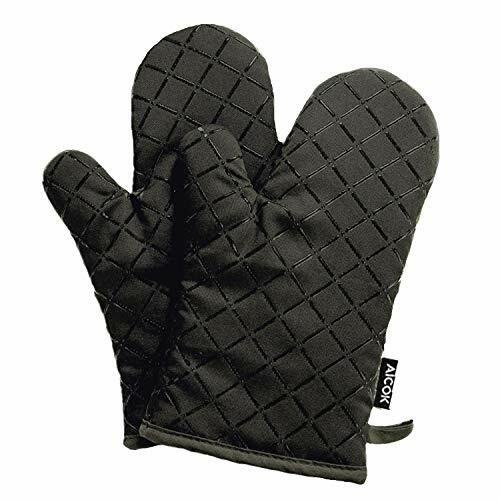 Aicok Cotton Quilted Oven Mitts offer full protection for your hands and wrists when touching hot items.Aicok Professional Oven Gloves give you extra protection from burns and scalds during all of your cooking activities. 2. FDA-approved-BPA-free, silicone grid provides an extra layer of protection between your hand and hot items. Also, the silicone provides an excellent non-slip material so items do not slip or fall. 3. At 10.8 inches long-Your forearms and wrists can be entirely protected from heat and burns. 4. Terrycloth interior feels soft and super comfortable for your hands. 5. Mitts have loops for easy storage. 6. Mitts are flexible and allow for easier gripping of small objects. 7. Silicone grid on both sides of mitt so mitts can be worn on either left or right hand. HEAT RESISTACE UP TO 464°F-- Aicok is your cooking helper.This Professional Oven Mitt with Special Cotton Lining not only is comfortable but also protect hands and forearms from high temperature when you touch hot dish,microwave oven racks or turn off the stove. EASY TO CLEAN-- The red color of oven mitts can mask stains.It's easy to clean.You just need to put it into the laundry bag and clean it by wash machine.They are both a practical and thoughtful gift for a great Hostess,Housewarming,Christmas or even for a Bridal Shower. SUPERIOR SAFETY LENGTH -- Aicok cooking gloves is 10.8 inch,which is long enough to protect your hands.It also can keep your hands flexible when you wear them . SPECIAL SILICONE GRID DESIGN--This cotton oven mitts with silicone grid can aviod the bowl of hot food slipping or dropping when you're taking it out the microwave. LIFETIME QUALITY GUARANTEE-- Aicok kitchen mitts have Lifetime warranty and guarantee 100% satisfaction. We promise full refund for any quality problems.